Hello everyone! Here I am! The exciting news is that I am soon going to have my own all-singing, all-dancing website. It is a bit held up at the moment as Bradley (Denise’s youngest ) who is helping out with the technical stuff has had exams. But watch this space. Slow and steady wins the race. People keep asking me to explain about my goings on, so here goes. I always like to be busy as I do think it keeps you cheerful. I love to make things and am a keen knitter and a bit of a dab hand at sewing too. I just have to have something on the go the whole time. Sadly, my family and friends all say they now have enough woollies and cushion covers to last quite some time thank you, and my little flat is also fully decked out and looking as fancy as can be. 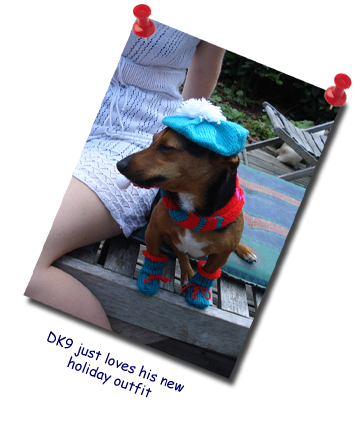 Even DK has enough doggy accessories to last him out, bless him. Then one day, on one of our brisk daily walks, I started to notice things in the street that looked a little forlorn and in definite need of a bit of a boost. 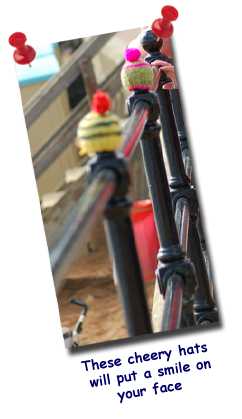 So I set to and got myself making nice woolly hats for rusted old railings and jolly outfits for statues that were unloved or just looked a bit chilly. This led on to cushions in bus shelters, curtains in kiosks and all sorts of other lovely things to help brighten up everyone’s day. I like to pop these things on as a nice surprise for people and so spread a little cheerfulness around. >Who knows, my little added flourishes might even get people to look at things through new eyes and if some sourpuss takes them down and makes off with them, I just make some more. There will be more about my doings along with some handy hints and fun things to make yourselves on my website soon but in the meantime Bradley says you can drop me a line using my email address – . It would be really nice to hear from anyone who has spotted my bits and pieces anywhere about so keep an eye out and do get in touch. Ta-ta for now.